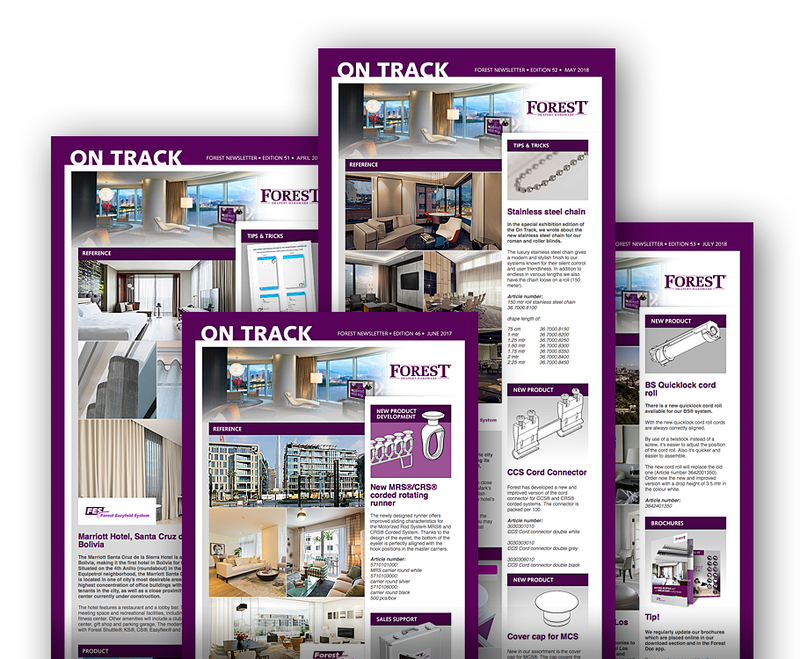 Would you like to be kept informed on a regular basis about the latest news, trends and product developments of Forest Group? Register for the monthly ‘On Track’ newsletter and don’t miss anything. If you want to unsubscribe, you can always use the link in the newsletter. Thanks for your subscription! You will receive our newsletter. Click here to navigate to our homepage. You can browse through our most recent newsletters. Hotel Grandium Prague, Let curtains shine with chrome rods!, Colour samples for Forest Rod Systems, Ton sur ton, Forest at R+T Asia, Online bending measuring tool. The Fontenay - Hamburg - Germany, New stainless steel chain, Decorative finials are now available for CRS, Watch the YouTube L-Pulley video, Forest on Dutch television, Let’s Meet!